As the impacts of climate change amplify, understanding the consequences for wetland dynamics will be critical for their sustainable management and conservation, particularly in arid regions such as the Columbia Plateau ecoregion. However, the data to model climate impacts to wetland ecosystems has been hampered by the lack of accurate maps showing their spatial distribution and data on their historical hydrological dynamics. Though these data may exist for particular wetlands, there are no wall-to-wall consistent datasets of wetland location and long-term hydrological dynamics. Climate change has emphasized the growing need to plan conservation actions across large landscapes and at longer-term time scales. As such, consistent datasets become critical to assess regional trends in wetland dynamics over time, including changes in wetland function. These assessments are necessary to understanding the full picture of wetland dynamics, and to develop – and achieve – conservation goals beyond “no net loss”. 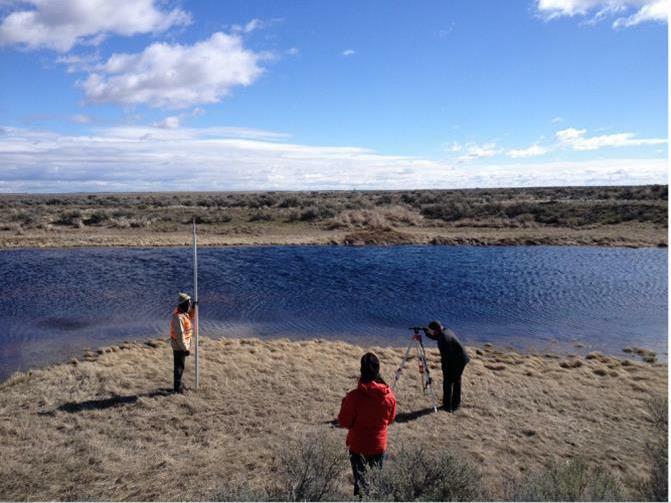 The intent of this project is to fill critical information gaps in support of wetland conservation efforts in the Columbia Plateau ecoregion under a changing climate. First, we will provide consistent, wall-to-wall data on wetland location, historical hydrologic dynamics, and projected climate change impacts on hydrologic dynamics. Second, we will work with managers in using these data to develop recommendations for climate-smart conservation of wetlands across the Columbia Plateau.